65+ Superfood Essentials contains CaprosÂ®, a patented and clinically studied Indian gooseberry extract. Indian gooseberry has been used for thousands of years in traditional Indian medicine, and CaprosÂ® is a modern advancement of that same berry. One factor that makes CaprosÂ® so effective is its incredible ability to absorb free radicals, not to mention that it also acts as a cascading antioxidant. A cascading antioxidant produces metabolites that are also antioxidants. Unlike many other Indian gooseberry extracts, CaprosÂ® has multiple clinical studies showing its benefits for cardiovascular support. This cardiovascular support, coupled with powerful antioxidant abilities, makes CaprosÂ® an ideal ingredient to support health as you age. 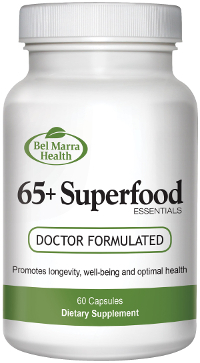 65+ Superfood Essentials is a breakthrough formula combining the rare and clinically tested Indian gooseberry extract with two other time-tested superfoods: Acai berry (the powerful natural antioxidant known to support total health) and resveratrol, which is a premiere anti-aging ingredient. This combination has the ability to support and promote cardiovascular and overall health. Caprosï¿½ is protected under U.S. patent #6,124,268 and is a registered trademark of Natreon, Inc. DIRECTIONS Take one capsule, twice daily or as directed by a health care practitioner. Do not use if inner seal is broken. WARNINGS Do not use if pregnant or breastfeeding. If you have or develop abdominal pain, nausea, fever or vomiting, consult a health care practitioner.